What Darkness Looms Ahead for Israel? In this past few years there has been a live, global, debate over the Iranian nuclear program and its potential meaning Israel, however this, as we all discover, is not the biggest threat to this country – but its own ignorant and anti democratic government and ministers. 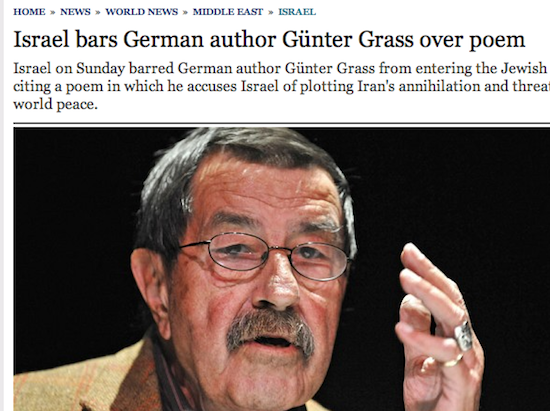 The German celebrated author Gunter Grass had published a song that implies that Israel is the real threat to Iran and not the other way around, his song might suggest that Israel, with its vast nuclear arsenal of weapons is more a danger to Iran than Iran is to Israel. This is not the first time that a writer causes a minor disturbance by voicing a somewhat nothing to do with reality concern (since it is exclusively Iran that consistently calls for the destruction of Israel and promises its demise), but here this guy gets some special treatment for Israel’s interior minister, Eli Yishai. Eli Yishai is Israel’s interior minister, he is the head of a movement which prides itself as a Sfaradi Jewish traditionalists, and of which a few prominent figures have spent, or are currently spending, some time in Israel penitentiaries as penalties for corrupt behavior. There is little doubt that Yishai is learned in the rules and laws of the Jewish religion, however he seems to have not taken any of this democratic ideas to heart. And Mr. Yishai has decided that since Mr. Grass had published his legitimate opinion over Israel, in a poem that he wrote, that he will not be allowed to visit Israel and will be considered a persona non grata. In a move that is outrageously ignorant and unimaginably dangerous the (no less than) minister of interior of the state of Israel is banning someone because of his opinion, oh the dark future that looms over Israel if this man continues to dictate his totalitarian bolshevism and bars important voices from singing out in Israel.